In this devotional painting, Saint Martina, a third-century martyr who was put to death for refusing to worship idols, gazes fervently at the Christ Child while holding the forked iron hook with which she was tortured, and accepting the palm of martyrdom. Cortona’s use of strong colors, agitated drapery, and the dynamic play of light and shadow enhances the image’s spiritual intensity. Saint Martina held great personal significance for Pietro da Cortona, who painted her image numerous times. Elected president of the Academy of Saint Luke in 1634, he proposed to rebuild the academy’s church in the Roman Forum. Excavations in the crypt, where the artist planned to be buried, uncovered Saint Martina’s remains. Pope Urban VIII came to view them, and his nephew Cardinal Francesco Barberini financed the rebuilding of the church—now rededicated to Saints Luke and Martina—with Cortona as architect. 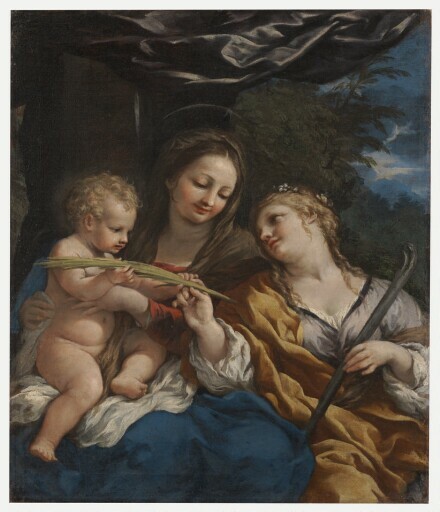 The Kimbell canvas was likely owned by the Cardinal; among Cortona’s known versions of the subject, only the Kimbell’s accords with the dimensions recorded in the Barberini inventories. The preeminent painter in Rome of his day and an architect of considerable invention, Pietro da Cortona developed a robust style that was ideally suited to the glorification of the Church and prominent patrons. Cortona painted a number of grand frescoes for princely patrons in Rome and Florence, as well as altarpieces, history paintings, and designs for tombs and other projects. probably by descent to his brother, Cardinal Francesco Barberini, prince of Palestrina [1662-1738], Palazzo Barberini alle Quattro Fontane, Rome. (possibly sold, as one of nine paintings, 27 July 1740). Welbore Ellis Agar, 2nd earl of Normanton [1778-1868], Somerley, Ringwood, Hampshire, England, by 1854.